The trick to artichokes is cooking them long enough and seasoning them well enough, otherwise the vegetable that some consider a delicacy can be lost. Down in New Orleans, we don’t steam artichokes and dip them in butter, we stuff them or dress them up with lots of seasoning and lots of personality. Check out my family’s recipe and enjoy. 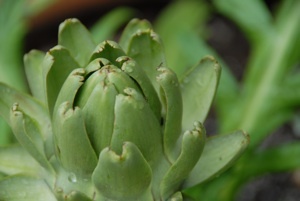 Place artichokes in pot and fill with water to half the height of the artichokes. Generously pour olive oil over the tops of artichokes. Add salt, garlic powder and Italian seasoning inside and on top of the artichokes. The more seasoning that gets in-between the leaves, the more flavor the artichokes will have. Bring water to a boil then lower to a medium simmer. Cover and cook for 1 hour. Check every 20 minutes and add water if the water level is below 2 inches. Artichokes are ready when leaves are removed easily and the meat is soft. Add more salt and seasoning to taste when testing artichokes. Once the meat is soft, sprinkle artichokes generously with Parmesan cheese, cover with lid until the cheese melts. Serve hot and enjoy.